Josh Brown|Aim Media Photo Lehman Catholic’s Sarah Gibson returns a drop shot against Milton-Union Saturday morning. For the second time this week, the Lehman Catholic doubles team of Angela Brunner and Sarah Gibson had their D-II sectional match start outdoors and finish indoors. And while they had to travel a little farther this time to resume the match, the outcome was the same. 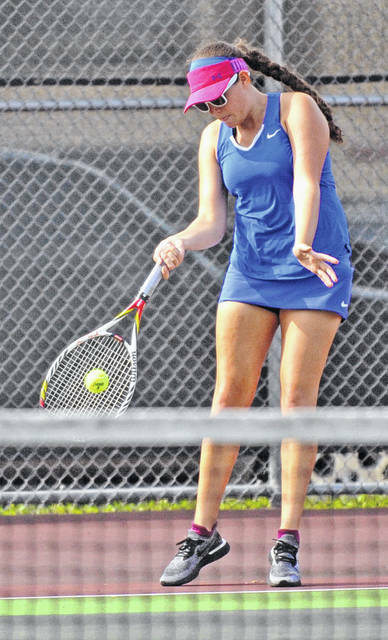 Earlier this week, in the go-to district match, Lehman had to move from Troy High School to Schroeder’s Tennis Center in Tipp City to finish off a win over Northwestern, winning the third set 6-0. Saturday, the fourth seeded Cavaliers were playing unseeded Addie Bell and Brianna Ward of Eaton in the third-place match to finish off the tournament. After rains came to Troy City Park, the match was moved to the Dayton Sports Complex in Trotwood. That’s when the Lehman duo rained down on Eaton’s victory hopes. Lehman won the next five games to take the first set and went on to a 7-5, 6-2 victory, giving them a third seed at Thursday’s D-II district tournament at the ATP Tennis Center in Mason. The day had started with a 6-0, 6-0 loss to the eventual district champions Meredith Fitch and Hannah Fugate. Still, Ungericht felt like the score didn’t indicate how well his team played. Now, the girls prepare for the district tournament. Gibson is a senior and Brunner is a junior. And hopefully, they can have a match finish the same place where it starts. https://www.dailycall.com/wp-content/uploads/sites/30/2018/10/web1_100618jb_leh_gibson.jpgJosh Brown|Aim Media Photo Lehman Catholic’s Sarah Gibson returns a drop shot against Milton-Union Saturday morning.